The most comprehensive way to discover the rich culture, authentic food and ancient history of Vietnam, these package tours offer all the convenience of a guided tour with all the intimacy of a private tour. Designed to be enjoyed by couples, these Vietnam package tours take in the sights, sounds and tastes of some of Vietnam’s most popular regions and attractions. Accompanied by a knowledgeable, English-speaking guide you’ll enjoy 8-13 nights exploring Hanoi, Halong Bay, Ho Chi Minh City, Danang, Saigon and the amazing Mekong Delta. These Vietnam package tours include everything from private car transport to nightly accommodation, domestic flights within Vietnam, daily meals, river cruises and more. Experience some of Vietnam’s most iconic landscapes and historical attractions on these private guided accommodated tours. The ideal option for those combining their visit to Vietnam with an additional destination, this incredible short stay tour showcases the best of Vietnam. From the famous Ho Chi Minh Mausoleum in Hanoi to the incredible beauty of Halong Bay, there’s something new to marvel at every day. From the ancient town of Hoi An to the unique farming practices of Tra Que ‘vegetable village, around every corner awaits a sensory overload. 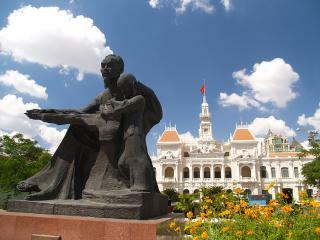 Uncover the fascinating history of Saigon’s Cu Chi Tunnels and enjoy a memorable cruise along the Mekong Delta. 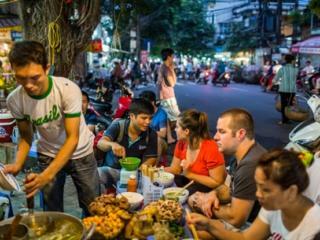 Enjoy the best of both worlds with this extended tour of Vietnam, exploring the cuisine, culture and history of Vietnam at a leisurely page. From traditional cultural displays in Hanoi to the UNESCO World Heritage beauty of Halong Bay, specialty local cuisine of Saigon and the ancient history of Hoi An. One of the highlights of this tour includes a relaxing 3 day beach stay where you’ll have free time to process all the incredible sights you’ve seen with no guide and no schedule to stick to. The most comprehensive way to explore the wonders of Vietnam, this extended package tour offers everything from a unique homestay in Hanoi to scenic trekking in Mai Chau, the breathtaking beauty of Halong Bay and an unforgettable royal dinner in Hue. As well as a visit to the tomb of Minh Mang Emperor, you’ll also enjoy exploring Cu Chi Tunnels and cruising the Mekong Delta. 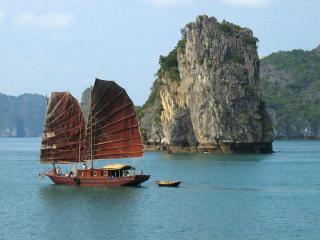 Experience unique modes of transport including a charming traditional wooden ‘junk’ boat and a 3 wheeled cyclo.